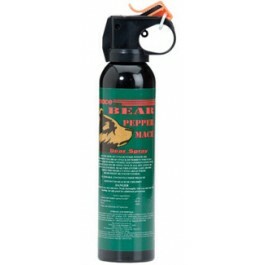 Buy Mace Bear Pepper Spray , from for $34.99 only in My e-commerce. Bear Spray is a safe, humane and effective way to protect yourself from bear attacks while fishing, walking, hiking, camping, and biking. The powerful magnum fogger delivers an extreme blast that reaches up to 35 feet! Mace Brand Bear Pepper Spray is the brand professionals trust! Mace Pepper Bear Spray contains 2.0% capsaicinoid concentration. The powerful Magnum fogger contains 260 grams and empties in 6 seconds, delivering an extreme blast that reaches up to 35 feet! It’s best to use Bear Spray in three (2) two second blasts. 1. If a bear approaches, do not run. This may trigger a predatory response, causing the bear to start chasing you. This is a race you will not win. Try to remain calm. 3. Aim at the bear and slightly downward, adjusting for cross-wind if necessary. 4. Spray a brief burst when the animal is 50 feet away. 5. If the bear keeps coming, give it another burst at 25 feet, making sure to aim directly for the face. 6. At 10 feet away, hit it directly in the eyes until bear spray empties.